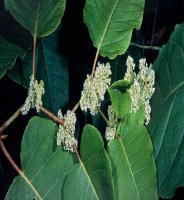 Fallopia sachalinensis (Sakhalin knotweed) is a perennial forb/herb (family Polygonaceae). Plants grow vigorously and create dense colonies that exclude other vegetation. Established colonies are extremely difficult to eradicate. It inhabits disturbed moist sites, roadsides, riparian and wetland areas. Plants typically grow in open, sunny areas on moist soils in cool temperate climates. Very little of this species occurs in California. It is a much bigger problem in the Northwestern US.